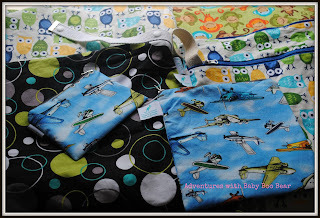 Google+ Adventures with Baby Boo Bear: Product Review: Sling Sisters Wetbags - Not just for the CDing family! Product Review: Sling Sisters Wetbags - Not just for the CDing family! Disclaimer: I did not receive free product in exchange for this review nor was I asked to write this review. These opinions are my own. When I was purchasing my initial stash of CD and gear I hadn't done much research into the wetbags that we would be using to store dirty diapers. Why? Everything that I had read suggested that Planet Wise were the way to go. Done. The store we were buying the starter stash from sold them. Perfect. Well. We got there and checked out the large wet bags from Planet Wise. Most of the prints were girly, very girly - think flowers. Nope, these were not going to match Emmett's room at all. So I grabbed one that was the least offensive to my liking and figured I'd buy more later. 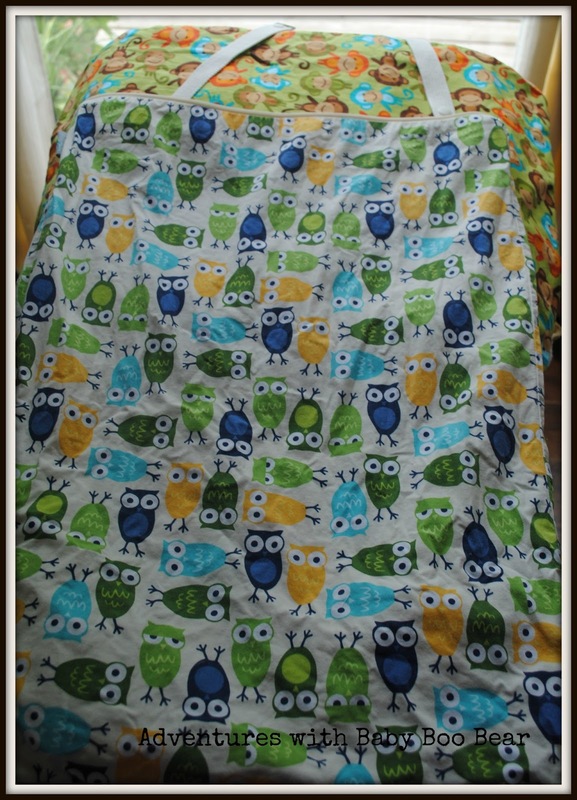 Then I glanced over to the next row of bags and saw monkeys, owls, swirls and loops. 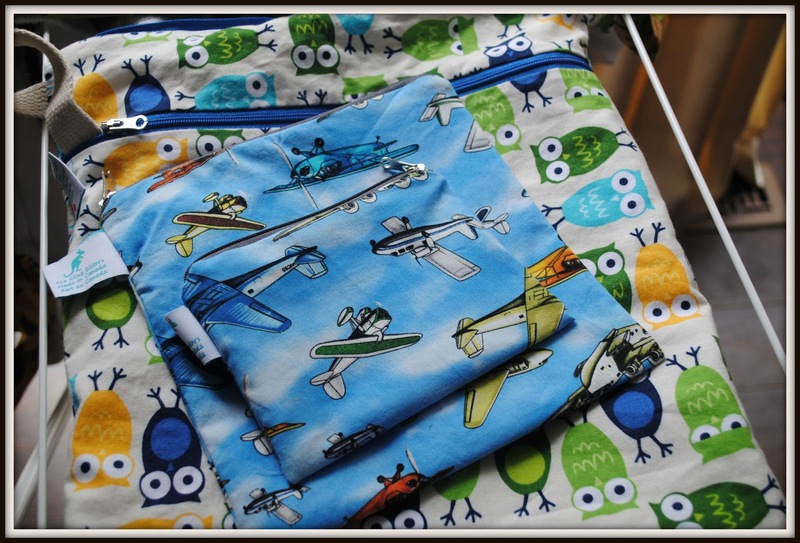 Fun prints and colours, lots of options for boys too! I grabbed an owl printed bag. I was hesitant because I hadn't heard about this company before. I asked one of the girls working and she told me that they just started carrying them and they hadn't had much feedback yet. 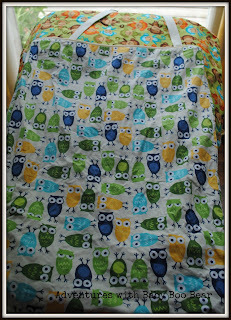 I loved that it was a Canadian company that made it and I loved the print so I figured we would take our chances. So glad that we did! My Sling Sisters wetbags are the BEST! No, seriously they are! What I love about these bags? Firstly, they are Canadian made. Yay! Second - I LOVE the designs and colours. They help make CD even more fun! Lastly - the functionality. Obviously the most important feature. 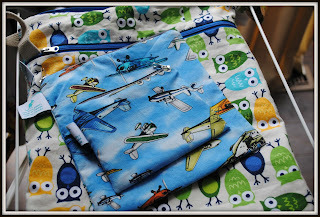 The extra large bags are huge and hold 3-4 days of cloth diapers (from their website and my personal experience). I love the straps on the top with the snaps. Most other bags don't have this snap. They make it simple to attach anywhere you want to store you dirty diapers. You could even take these bags camping, to the beach, on overnight trips etc. Regular sized wetbags (we own 3!). These are great for on the go! When we CD outside of the house we take one along to store the dirty dipes. We just snap it onto the diaper bag. I think I've stuffed about 7 CD into this guy. If we are using disposables for whatever reason while we are out I still bring along a rolled up regular bag. Just in case I need to store clothes that have been spit up on, had a diaper blow out etc. I also take along a regular sized bag to swimming lessons to keep mine and Emmett's bathing suits away from oh I don't know...say my cellphone! One of our regular sized is also their double duty bag. It has a stay dry zippered pouch to keep the wets and the dry stay dry. A couple of weeks ago I participated in a fun, online auction the Sling Sisters held on their Facebook page where they offered slightly imperfect, yet still functional items at a discount. Auction style. I was determined to get a double duty bag. In the end I did not. I did end up with 2 reusable sandwich bags which I am super excited for but I should have been smart like my friend Megan, she bought her stuff earlier in the day on their website to ensure she got what she wanted. The auction offered bigger lots of items for ultimate discounts so I opted to try my luck. It was 2 hours of FUN. Since I bought our first Sling Sisters bag I have heard much more talk of this great Canadian company. Their product is great and at a better price than their competitor. They also offer more than just wetbags. Be sure to check out their website! I give their wet bags 5 stars! Next on my list...I need to get my hands on some of their ninja prints!